Before you hire a pet sitter, it’s important to know what to expect. Like any field, there are misconceptions out there about what pet sitters do. Here are some of the most commonly misunderstood things we hear from our clients, and how we set the record straight. Pet sitting a legitimate profession just like accounting, plumbing, or any other type of occupation someone can pursue. Anyone can technically do the job, but doing it well is something else entirely. It requires skill to enter a stranger’s home and care for pets with different needs and routines. 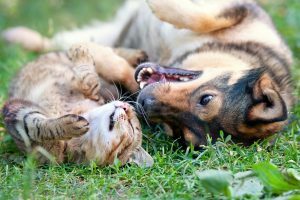 The National Association of Professional Pet Sitters serves as a governing body and resource for pet sitters across the country. The organization helps set industry standards and ensure that pet sitters follow them. Organizations like this one show that pet sitting is more than just a side business, it’s a legitimate career that is complex and requires a caring touch as well as a high amount of discretion and professionalism. Pet sitting is about much more than walking and feeding animals. There are legal and ethical questions around every corner when you enter a client’s home. Giving a teenager a few extra dollars to look after your pets will get the job done. However, it also opens you up to risks that you might not even know about. Professional pet sitters know those risks and how to handle problems when they arise. Professional pet sitters like For Your Spot also carry insurance that can protect your pet and your home in the event of an incident. We’ve seen just about everything and know how to handle an emergency situation without losing our cool. We also do light house cleaning related to your pet and will even water your plants and take care of other maintenance tasks upon request. If you’ve spent any time as a pet sitter, you know this is far from true. Pets require time and attention just like people do. Every pet is different and a professional pet sitter understands those nuances and treats each animal as an individual. For some pets, the idea of being around new people is a scary and overwhelming experience. Professional pet sitters provide the extra level of care needed to make them feel safe and comfortable. We do it all with a level of professionalism that can give you the peace of mind knowing that an important part of your family is well cared for while you are away — whether that trip is two days or two months. If you’d like to learn more about the difference a professional pet sitter can make in your life, schedule a consultation to get started. Should your dog go back to school this Fall?